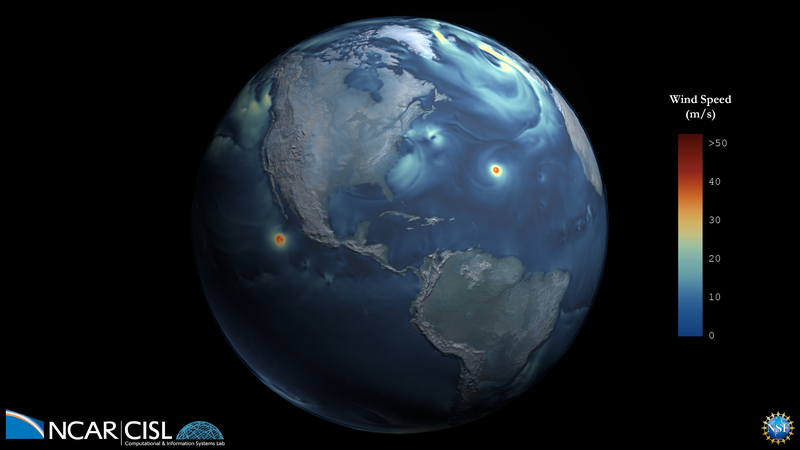 This visualization shows the magnitude of the wind speed over the course of one year from atmosphere-only simulations of the high resolution (horizontal 1/4 degree) Community Earth System Model simulating the present day climate. Computing resources (ark:/85065/d7wd3xhc) were provided by the Climate Simulation Laboratory at NCAR’s Computational and Information Systems Laboratory, sponsored by the National Science Foundation and other agencies. An award of computer time was provided by the Innovative and Novel Computational Impact on Theory and Experiment (INCITE) program. This research was supported by the Regional and Global Climate Modeling Program (RGCM) of the U.S. Department of Energy’s, Office of Science (BER), Cooperative Agreement DE-FC02-97ER62402.